I admit it - I'm a big fan of Aldi. I have been shopping at Aldi almost every Monday for at least a year and a half in an attempt to save on our monthly grocery bill. I love Aldi because, for the most part, everyday food items are cheaper and the quality is excellent. I definitely feel that I am getting great value for money. 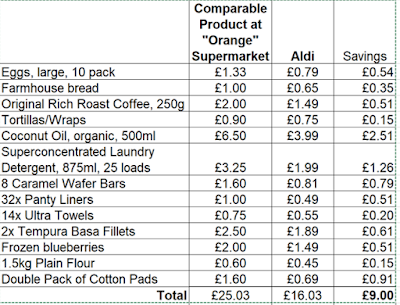 I'd love to share with you which products from Aldi I buy on a regular basis and the prices of a comparable product at my favourite "orange" supermarket. As you can see, in this one "basket" I saved £9.00. That's a lot! This doesn't even include fruit and veg, which I mention below. We love Aldi's Everyday Essentials Mature White Cheddar, but I couldn't find the price of it quick enough to include it in this blog and I don't have the package anymore to look at how much cheese this is. However, if my memory serves me right, this is a 1kg block of cheese that costs about £3.50. When open this cheese, we cut it in half and wrap both halves in cling film/ plastic wrap. We use up one half before using the second. The second half has never molded before we use it either. I included these cotton pads in the list above, but I have to say, they are so cheap and softer than the basic variety at the orange supermarket. 200 pads at Aldi cost 69p but £1.60 at the orange supermarket. What a difference! Ok, I'm just going to mention it: feminine hygiene products at Aldi are just as reliable as what you'd buy at the supermarket but WAAAAYYY cheaper. Just a gentle nudge to try them for yourself (if you are a female, of course!). A few more of my favourite things from Aldi are: frozen fish fingers, frozen fruit and veg, crisps, some cereal, biscuits (though my husband finds the digestive biscuits to be too sweet) and houmous. 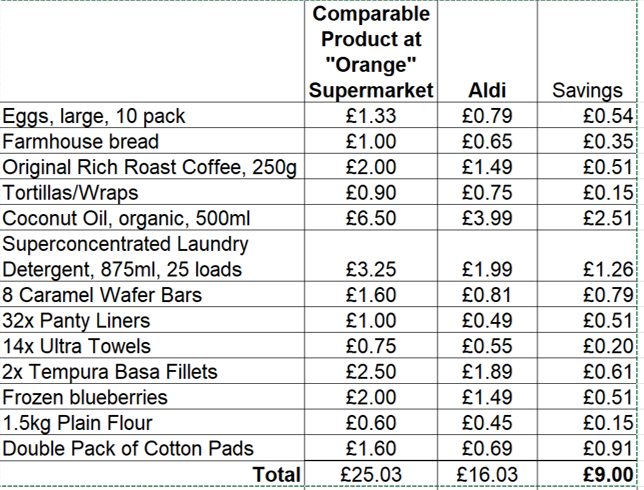 In addition to the products listed above, prices on fresh produce is also much lower than the supermarket, especially the new-fortnightly "Super 6". These super-buys are 6 fruit and veg favourites marked down to an even-better price than usual. I will write a separate blog post on the bargain fruit and veg at Aldi. Some people say that Aldi's produce molds quicker than at the supermarket, but I have never found this to be the case. Oh, and quick a quick tip, Aldi charges per banana, not by weight, which I find can be more expensive than at the supermarket, but I will find out exactly when I post my fruit and veg blog. There are a few things at Aldi that I don't like as well as the comparable products at the orange supermarket: toilet paper, tissues, bacon (it's too thin), body lotion and jarred pasta sauce. BUYER BEWARE! Aldi does sell name-brand products. Just because it's being sold at Aldi doesn't mean it's a good price. Quite often I've found that name-brand products are more expensive than at the typical supermarket. Please make sure you're getting a great price on an item before you automatically put it in your trolley/cart. Just like anywhere and any time you shop, you have to know your prices. Learn whether your favorite item or brand is a good buy by keeping track - either simply by remembering or by writing it down - of the quantity versus the price. You don't have to shop at Aldi but if you want to spend less on your supermarket shop, I want to encourage you to figure out whether what you're buying a good deal or not.